Home Grief Virtual Book Tour? 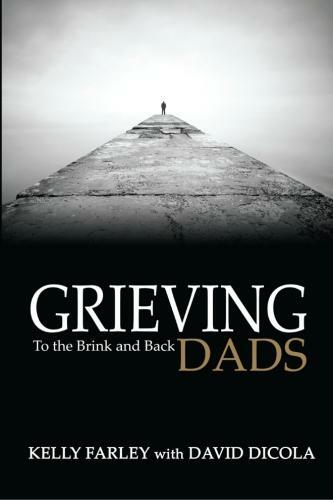 I have to be honest, I have not read my book Grieving Dads: To the Brink and Back since it was published in June 2012. I have read the book multiple times as a draft and through the editing process. I have done a few book readings of the first chapter or two at support groups I was invited to, but I have not read it from cover to cover since it was published. That being said, I do believe I am in need of a “tune-up” in my attitude and I believe rereading the book can dial me back in to what is really important in life. A reminder of how far I am come since the very dark and desperate days of trying to survive the aftermath of losing two children. I have become restless and frustrated with myself in recent months. Restless because I want to accomplish and do so many things but there are times I just can’t focus long enough or have the energy to follow through. I believe a lot of this is tied to the after effects of the impact my mental state took from the blow. I need a reminder that getting out of bed with a smile and a spring in my step is a HUGE deal and I should not take it for granted, I should be proud of myself instead of beating myself up for not doing more. I do plan on reading the book over a few month time frame, but this time I wanted to do a virtual book reading. I would video tape me reading the book while stopping at critical points and discussing my thoughts on the subject. However, before I spend the time and energy doing this, I wanted to find out if anyone would be interested in following along in the book and participating in the discussion. Would you be interested I participating in a virtual book tour? Would it be possible for the mother of a son whose infant daughter transitioned after 23 days to participate? I just purchased the book through Amazon for my son, who asked for the book, but neither of us have read it yet. I’m in. 2 1/2 years out and the nightmares, albeit different nightmares, are back. I could use a refresher. I would follow you and be part of the discussion too! Kelly – of course, count me in. You and the book continue to be a great inspiration in helping me cope with our loss. Yes, I would follow. I’m reading it for the first time. My girl passed away 88 days ago. I would be interested. I read the book over a year ago and was thinking about reading it again. I would love to hear your thoughts as you go back through the book. It will be tough to find a time that works in a packed schedule, but it would be worth the effort for me. Yes. I would like to try it. Yes! I think this is a great idea. I would certainly read along with you. Yes – I would. You hit the nail on the head as did your book with my complete inability to focus and lack of energy. Thank you for your continued efforts on behalf of Grieving Dads. Yes. I’ll re-read the book w/ you. Read it back in 2012 and am also in need of a tune up as we approach 9yrs w/o our oldest child.